Echoing his comments early this year that a hard landing is practically unavoidable in China, billionaire investor George Soros issued another warning on Wednesday at an Asia Society roundtable in New York that China's credit-fueled growth bears resemblance to the conditions in the US in 2007 and 2008 before the global financial crisis. He suggested that most of the new loans are made to keep loss-making firms alive. 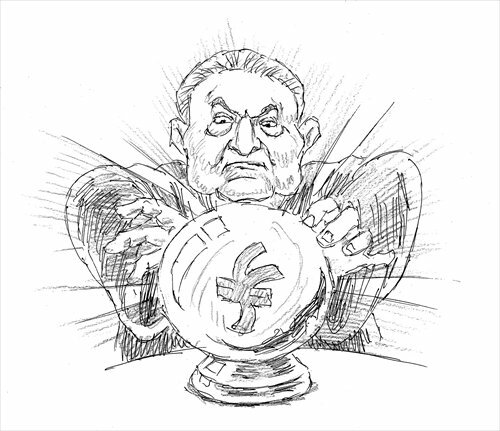 Soros' latest comments were probably based on his observation of China's recent economic data. Total social financing, a key indicator of China's credit expansion, rose to 2.34 trillion yuan ($360.8 billion) in March from 780.2 billion yuan in February, while new local-currency loans made by Chinese banks totaled 1.37 trillion yuan, both beating market expectations. In addition, the total social financing reached 6.59 trillion yuan in the first quarter, with bank credit totaling 4.51 trillion yuan and mortgage loans more than 1.5 trillion yuan, up 25 percent year-on-year. All these figures are record high. This is one of the key reasons why home prices in the first and second-tier cities have soared recently. That means Soros believes that China's credit expanded excessively in the first quarter, but the loans did not flow into the real economy - instead they either went into the real estate sector to push up home prices or into some zombie firms in China. He believes such practice can pump up China's economy in a short term, but it forebodes disaster if property bubbles burst or risks get out of control, leading China to a point where the US was prior to the 2008 global financial crisis. Soros' latest warning was either disregarded in China or denounced by some as "conspiracy." If Soros' assertion on the Chinese economy is a conspiracy, his investment should not have lost so much this year. In the past few months, Soros' investment team have shorted Asian currencies and withdrawn from the Asian market. Probably due partly to this investment principle, Soros' family fund Soros Fund Management performed poorly in the first quarter, posting a loss of 4 to 5 percent in the first quarter. David Rogers and Joshua Donfeld, two portfolio managers at Soros' family office, are reportedly leaving the firm. The underperformance of his fund seems to indicate that Soros does not fully understand the real situation of the Chinese economy and has never expected that the Chinese government would step in to bail out the economy. The fact that Soros viewed what happened to the Chinese economy based on market principles makes it impossible for him to come to a proper conclusion. But observing China's economy using market principles is not necessarily wrong, nor is a conspiracy. The only problem is that China's current market conditions are a lot different from those assumed by Soros. That said, we cannot deny that China's debt risks are continuing to rise. How should we view Soros' latest warning on the Chinese economy against this backdrop? We cannot simply avoid discussion of the issue using the conspiracy pretext or totally disregard it simply because Soros shorted the Chinese currency yuan and made doomsday predictions on China's economy. We should rationally assess the real impact of the fast-growing credit on the economy. Even if the impact is not that huge, we should nevertheless calculate the negative factors. Only in this way can we find out the real problem China's economy is facing. In fact, the debt risks caused by the fast expansion of credit in China are quite different from that in developed countries and other emerging economies. This is because the debt, wealth structure and type of wealth possessed by Chinese residents differ considerably with those in other markets. In this case, an assertion based on a few sets of data can hardly be rational and correct. But on the other hand, excessive expansion of credit in whatever form can inevitably lead to a financial crisis. This is applied to the US and Europe as well as to the Chinese market. Some observers believe that in an economy where the government has relatively greater control over how the economy runs, excessive credit expansion will never happen. This belief is also a fallacy. Ensuring a proper amount and pace of lending as well as the quality of lending based on real demand is still vital to keeping the country's economy sustainable.